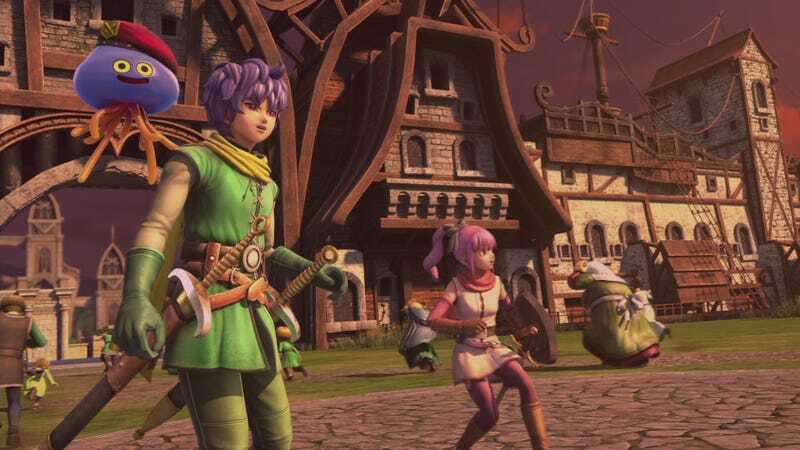 The first Dragon Quest Heroes was a a satisfying combination of Dragon Quest characters and creatures with Dynasty Warriors-style battles and structure. With an overworld to traverse filled with random encounters and hidden treasures, Dragon Quest Heroes II feels a lot more like . . . well, Dragon Quest. Being more a fan of the Dynasty Warriors games than the Dragon Quest series, I must admit I did not pay a lot of attention to this sequel leading up to today’s launch on PC and PlayStation 4. I liked the first game well enough and figured I was in for more of the same. As I watched and played through the game’s opening moments, there was no indication otherwise. The graphics are still sharp as hell, and the English voice acting this time around is top-notch stuff (the accents really make the Toriyama character designs work for me), but as the opening moments wrapped up and I was launched into a hack-and-slash battle, I figured I was getting what I expected. But after that massive battle, the introduction of red-haired envoy Desdemona and the massive boss fight, something was very different. Tasked with seeking an audience with the High King to keep two rival nations in the otherwise peaceful Seven Kingdoms from going to war, pink-haired Theresa, blue-haired Quispy (I named him myself) and their new friend found themselves in a vast open countryside. Instead of moving from area to area, clearing out enemies and capturing bases, we were free to wander as we pleased. Check out the video below for a quick look at the game’s first overworld map. Mind the rapid cut-off, as my capture card is being a bit finicky today. At first I was so taken aback I didn’t know what to do with myself. I was looking for goals to complete and commanders to defeat. Instead, small hordes of Dragon Quest monster mainstays roamed the countryside, waiting for a band of warriors to wade in. Story encounters, such as the one that added this familiar face to the party . . .
. . . occur when you enter a specified region of the map, rather than being baked in to battle sequences. The battle sequences are still present in Dragon Quest Heroes II, and they are mandatory for progression. The in-between bits—the journey—is a whole lot nicer. The open maps offer opportunities for exploration that other Omega Force Dynasty Warriors-style games lack. There are moments, wandering these vast stretches, avoiding or engaging creatures in battle, hunting for treasures with my crew, that it almost feels like I’m in an MMO group. Once I start exploring Dragon Quest Heroes II’s co-op and four-player multiplayer missions, I imagine the feeling will only grow stronger. Caught up in a tangle of new releases, I’ve still got quite a ways to go in Dragon Quest Heroes II, but I’m enjoying getting there.